Following a topping-up ceremony late last month, Kuala Lumpur city’s latest luxury living benchmark, Star Residences, is already offering stakeholders and interested investors a closer look at the lifestyle proposition as well as the stunning views the 58-storey residential project will offer. 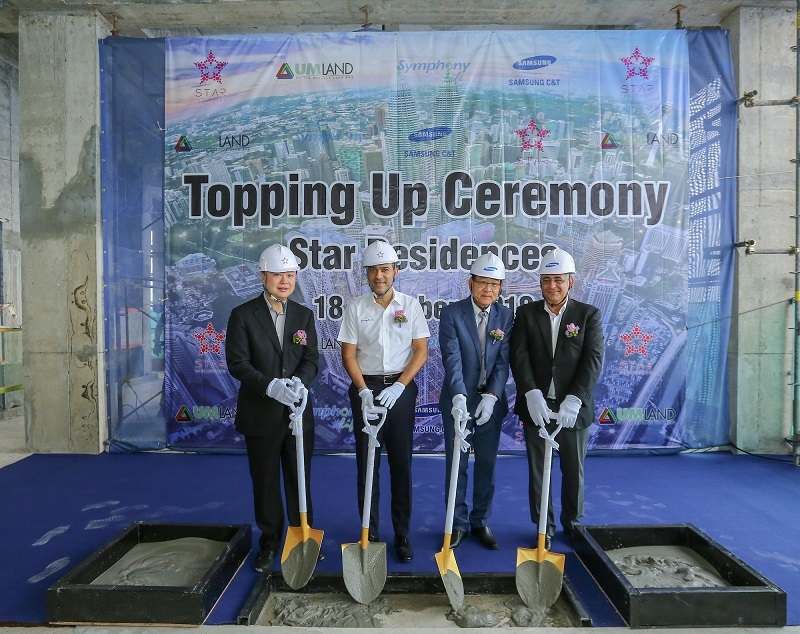 Star Residences is part of Star Development, a RM3billion mixed development project comprising residential and retail units. Components include one 57-storey and two 58-story towers that will house the Ascott Star KLCC Kuala Lumpur, Star Boulevard and Star Walk of Fame, as well as five blocks of six-storey units for retail, food and beverage, and entertainment outlets. The four-acre site is located Jalan Yap Kwan Seng, within the vibrant KLCC central business district. The project developer Alpine Return Sdn Bhd is a 50:50 joint venture company established by Symphony Life Bhd (formerly known as Bolton Bhd) and United Malayan Land Bhd (UM Land). Construction on the project began in 2014 and according to Alpine Return is expected to be fully completed in the later half of 2019. Currently, Star Residences Tower 1 is already 100% sold, while units at Star Residences Tower 2 have already reached the 90% sales mark. Additionally, premium units at the Ascott Star tower were launched just a few months ago. The project has attracted plenty of attention given its prime location at the heart of the city and premium lure. It has also bagged several international awards namely, International Property Awards, London for Best Apartment Design, Best Mixed-Use Architecture Design and Mixed-Use Development Concept. It also received Malaysia’s BrandLaureate Best Brand Award, in Signature Brand Property Luxury Condominium category. Interestingly, the construction main partner in this luxury development is Samsung C&T, leading company Korea that is involved in a variety of global business activities, including construction business, global trading and project organizing, fashion business, and a world-class resort & leisure business. Attending the topping-up ceremony last month were Chairman of Alpine Return Tan Sri Azman Yahya, executive deputy chairman of UM Land Datuk Ng Eng Tee, UM Land group managing director Dennis Ng, Alpine Return CEO Alan Koh, and executive vice presidents of Samsung C&T John Chang and Ahmad Abdelrazaq. At the event Azman said the overall Star Development project has taken shape on schedule within the construction timeline, and it has achieved this with an exemplary safety record. “I’m immensely proud of this milestone with zero accident, consistent quality standard and site safety standards,” he said, citing Samsung C&T’s reputation for delivering on time as well as its emphasis on safety and compliance. Among Samsung C&T’s most iconic projects are the Burj Khalifa in Dubai, the world’s current tallest building and Malaysia’s own Petronas Twin Towers. Samsung C&T Corporation’s Chang said that the company had applied its construction technology expertise to the project so that it delivers on its promise of a new level of residential luxury in the highly sought-after KLCC locale. “The achievement is only possible through the excellent support from Alpine Return, Symphony Life and UM Land. They entrusted Samsung C&T to deliver the tallest iconic high-end residential project, adding to the Kuala Lumpur skyline,” Chang said, adding that he was happy to play a part in fulfilling this vision. For more information on Star Residence, please contact their representatives at +603-7490 2211 or visit www.star-residences.com.